Enter through a wrought iron gate into a courtyard and then into the entry hall. At this level also has an enclosed garage; an all purpose room and laundry with a full bath. The mid level has a master suite and guest suite both with private ceramic baths and terraces. A beautiful stair leads you to the upper "PALAPA" level designed in the popular "Pacific Style architecture. 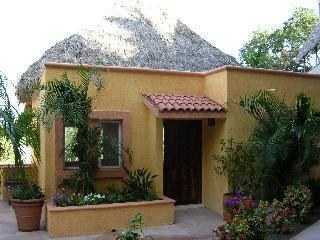 The open plan under the palapa has the living/dining room, terrace and the kitchen and half bath are ajoining. 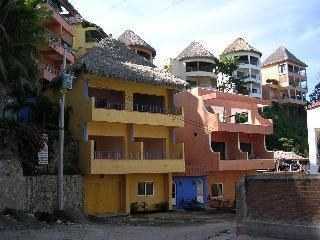 Each Casa is on it's own lot. The Homeowners Association takes care of the land scaping, the pool and the water system. Included in the price is a 10% ownership of the pool and Center Multicultural Art Center. 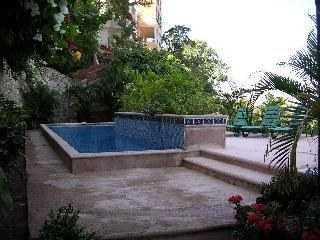 Located just 100 meters from the Costa Alegre's best beach. This quality built home opens onto the pool level of this unique community.